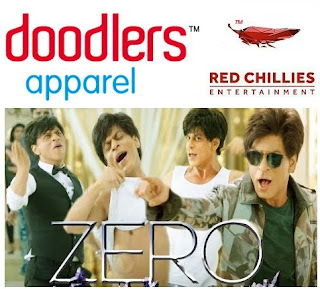 Red Chillies has partnered with Doodlers as their Official Kids Merchandise Partner. Doodlers are a trendy apparel brand for kids from the age group of 5-15 years. The brand is gaining popularity with its presence in 53 exclusive stores and is also available in leading clothes stores across the country. Designed against the mundane, the clothing apparel encourages kids to stand out from the crowd and celebrate their uniqueness. Red Chillies has launched an exclusive online store (https://shop.redchillies.com/collections/kids), which also features the Doodlers apparels exclusively and other range of exciting merchandise. The Zero Collection is currently available at Doodlers stores across India.